[편완식이 만난 사람] "전통의 재발굴 돋보인 평창 개막식.. 내가 갈 길 보여줬죠"
We have to regard it as a future cultural resource. He clarifies by saying, “Considering how Korean-style painting can trace its origin and tradition back to Goguryeo and Silla painting, we are naturally able to predict the future,” and “that tradition is an ancient future.” Credited as the leader of contemporary Korean art in his 40s, Kwon Ki-soo (46) was moved to tears during the opening ceremony of the 2018 PyeongChang Olympics. Taking the motif of his work from tradition, he fascinated people all around the world with inmyeonjo, a human-faced bird pulled from an ancient Goguryeo mural. 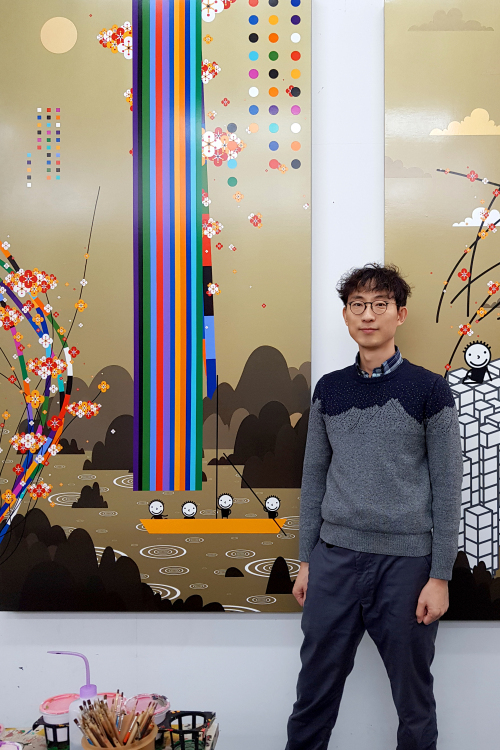 He became further convinced that tradition is like a torch that lightens the path Korean art must tread while honing his works to exhibit at the Hong Kong Art Fair. “We have to put more stress on evolving tradition rather than adhering to it. We were not able to preserve ours due to upheavals in our modern and contemporary history. It would perhaps be meaningful to clarify what Korean tradition encompasses. Many misunderstood the inmyeonjo featured in the opening ceremony to have originated from Japan or China. Some traditional elements of Korea are often misunderstood to be Japanese or Chinese while some foreign elements tend to be mistaken as something traditional. As in this opening event, officially displaying more traditional aesthetics could be a source of admirable ideas by artists and people engaged in the field of visual culture, he said. In fact, there are a lot of traditional elements we find in our everyday life but we tend to think have come from Japan or China. That’s mainly because such traditional factors have not been sufficiently addressed by the academic world or the press. Experts consider the ancient mythology pertaining to the man-faced bird was widespread in Northeast Asia in that its images were found in unearthed articles from ancient Silla and Baekje tombs and a variety of human-faced birds were depicted in the Classic of Mountains and Seas (Shan Hai Jing, 山海經), the first collection of Chinese myths. His character Dongguri has eyes like two ink dots, bristled up hair that resembles ink lines, and a big grinning mouth. People see it as a pop character. 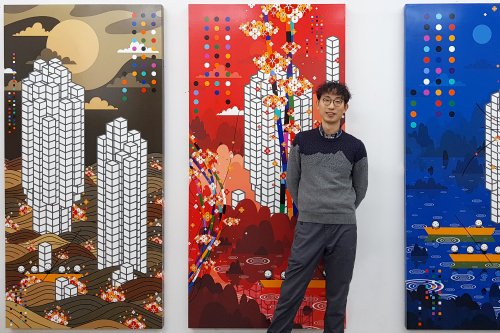 He resolutely declines to define his work as Korean pop art. If his works are defined merely as part of pop art, they are less unappealing to the global art scene , thus, what matters is differentiation. 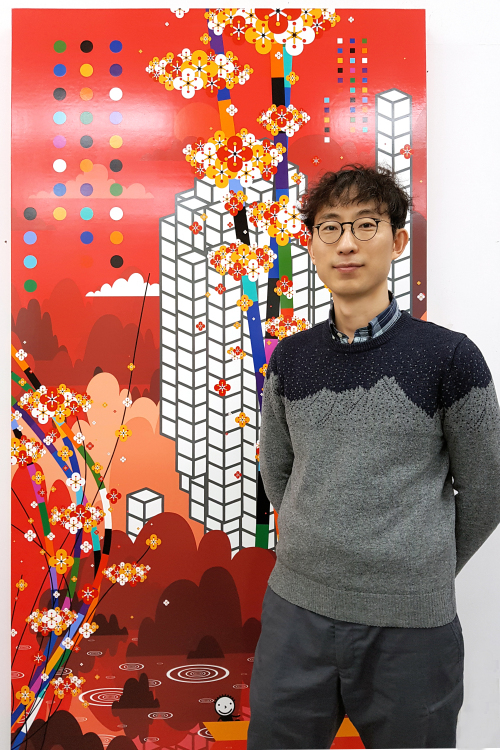 The majority opinion of the art world is that we need some keywords to define an army of artists such as Kwon Ki-soo, Lee Se-hyun, Kim Kira, Hong Kyung-taek, Hong Ji-yoon, and Jung Jae-ho who involve tradition in their contemporary exploration and a group of artists who engage in digital work. He hopes his art is criticized and interpreted by not only art critics but also by experts from diverse fields including music and literature. He plans to publish a collection of critical essays on his art along with articles that speak ill of his works from the perspective of contemporary art. If necessary, he is ready to accept other artists’ comments. A tropical plant called tropic snow was growing thick in the office space of his studio I visited last Sunday. 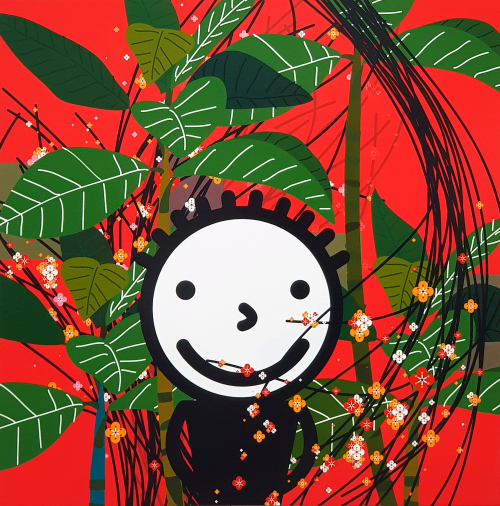 The green leaves featured in his recent paintings are also tropic snow leaves. He depicts liberal gestures so as to take a step forward in a way that is predicated upon tradition. He says he tries to have refreshments in an atmosphere like that of a resort. How about plum blossom-like images? They appear immeasurably ostentatious with stems whose black lines are in sync with rainbow-colored fields. He thinks his majoring in Oriental painting made it possible for his flowers to resemble plum blossoms. Circles turn into lines or squares. A fountain also looks like an orchid. His lines turn into squares or cubes, reminding viewers of bizarre stones or precipices in traditional paintings. People nowadays see them as apartments. This is a representation of the harmony between tradition and modernity. The flashy rainbow image is brought from a rainbow bridge in traditional painting. It is an arch-shaped bridge spanning the valley peddlers or Confucian scholars passed through. This is also a symbolic passageway between this world and an ideal world. Pestered by a dispute that it is dependent on a Japanese style, he stresses that we have to reform the tradition of Korean color painting. The variety of different colors he has developed are arranged in his studio with serial numbers. This results in his studio looking like a laboratory and serves as an opportunity to catch a glimpse of his intense work process. 13 with Google "The art of a homepage"